Skiing and snowshoeing open the season on December 7th, weather permitting. Fees are $10 for adults, $8 for seniors (62 years and older), $8 for youth (5-15 years) while kids four and younger are free. Five-day passes are available for $40 per adult and $32 for seniors and youth. Reservations are not required but all must check in and depart from the Valle Grande staging area. Also, the Valle Grande Trail, Coyote Call Trail, and the surrounding area on the south side of State Highway 4 will remain open every day for hiking, skiing and snowshoeing free of charge. Christmas Tree Sales begin the day after Thanksgiving on Friday, November 23rd, and continue through December 23rd at the Staging Area. Trees will be sold during regular business hours on a first come first served basis for the cost of a $20 permit fee which will go to support the Preserve. Three Special Moonlight Events dot the schedule on Friday, December 28th, Saturday January 26th, and Sunday February 24th. The Moonlight Events run from 5 p.m. – 9 p.m. 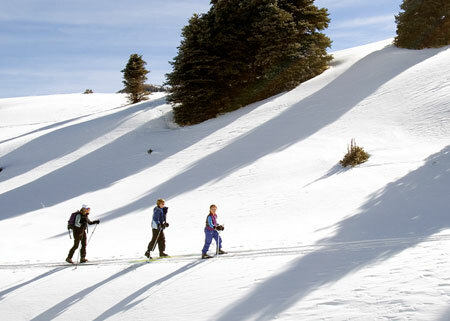 The self guided, skiing or snowshoeing activity offers visitors the unique opportunity to experience the Valle Grande during full moon conditions. Moonlight skiing and snowshoeing permits will be sold at the Valle Grande Staging Area beginning at 5PM at $15 for adults, $12 for seniors, $10 for youth and free for kids four and younger. Visitors should be prepared for high elevation, winter mountain weather, and night conditions. Horse-drawn sleigh or wagon rides offer visitors an hour long ride through the winter landscape. Rides are $30 for adults, $24 for seniors and youth, and free for kids four and younger. Reservations are recommended to guarantee a seat but drop-ins will be accommodated if there are seats available. Visitors can get an early start on 2013 by enjoying the Fourth Annual New Year’s Eve Fireworks Celebration in the Valle Grande. The festivities will begin at 5:00 pm and include skiing, snowshoeing, bonfires and end with a fireworks display at 8:00 pm. Ticket reservations are required to enjoy in all the events and include reserved parking, a skiing/snowshoeing permit, food and a raffle ticket for a door prize. Reservations are $25 for adults, $20 for seniors and youth, children four and younger are free. Visitors who want to see only the fireworks can take the family for a $20 per vehicle cover charge at the main gate the night of the event while parking is available. Details on events reservations can be found on our website at www.vallescaldera.gov or by calling 1-866-382-5537.